www.orlandoblindsshutters.com has been a pioneer in offering window treatments that are best for your space and also suited to your pockets. the other perks is full customization, extensive range of commercial and residential blinds, shutters and shades, free consultation and estimates and professional guidance and then free installation. Let us now know more about solar shades. Made from woven fabric that is light but heavy enough to block the light, they come with openness range running from 0 – 25%. The USP of the solar shades over other is that while others completely block out the light coming in, solar shades allow you to enjoy the outer view even when they are closed. The degree to which you open would determine the amount of light coming in. They are a type of solar shades that comes with a fabric panel which rolls up when it is open. You can choose from three valance options – aluminium fascia for a cleaner look. it covers the rollers and the corresponding brackets. Another option is cassette. It is rounded unlike teh square one ans you can choose them in contrasting colours to create a dramatic look or keep the entire thing same for a more coordinated look. well, last but not the least, you always have the no valence option to choose from. The cordless lift system that now comes with child lock is pretty popular these days. It has a motorized system fit in that omits any chance of strangulation. And then they lend a clutter free and clean look. Do you know that solar shades rank high in controlling the UV rays that comes in your homes and is a potential threat to people and even furniture? They help in controlling the temperature thus keeping cool inside during summers and well in winters it is warm indoors. They also reduce glare and so TV watching becomes more enjoyable. Because of the openness aspect, visibility could be an issue especially at night and so if you are planning to choose it for your bedroom or living room, choose the one with minimum openness percentage. 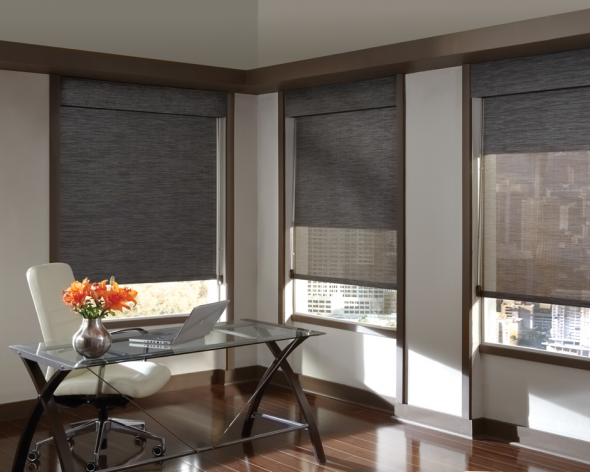 You can well complement the solar shades with draperies to increase privacy level.